HAYS, Charles, a Representative from Alabama; born at Hays Mount, near Boligee, Greene County, Ala., February 2, 1834; completed preparatory studies under private teachers; attended the University of Georgia at Athens and the University of Virginia at Charlottesville; was a cotton planter and also engaged in other agricultural pursuits; was a delegate to the Democratic National Convention at Baltimore in 1860; during the Civil War was a major in the Confederate Army; member of the constitutional convention of Alabama in 1867; served in the State senate in 1868; elected as a Republican to the Forty-first and to the three succeeding Congresses (March 4, 1869-March 3, 1877); chairman, Committee on Agriculture (Forty-third Congress); died at his home, Myrtle Hall, in Greene County, Ala., June 24, 1879; interment in the family cemetery, ``Hays Mount'' plantation. 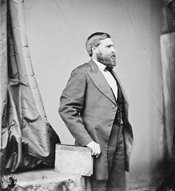 Rogers, William Warren, Jr. Black-Belt Scalawag: Charles Hays and Southern Republicans During Reconstruction. Athens: University of Georgia Press, 1993.